POSTPARTUM — WHO AM I NOW? 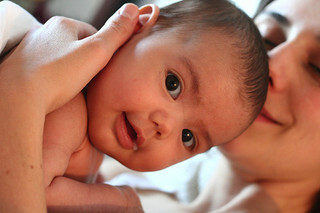 There’s plenty to love about postpartum, especially your baby. Still, over and over what I hear from women is “I never thought it would be like this!” There’s an element of surprise—and sometimes shock—to becoming a mother of a child who lives not inside your body, but outside: fussing, crying, nursing (or refusing to), sleeping (or not), peeing/pooping – and doing any of the above at all hours of the day and night. Many, many women are simply not prepared for the constancy of childcare, for how a baby rightly requires a mother to give over her time and energy Many a mother is surprised at how much she wants to tend her baby through her exhaustion even though life is different than she may have expected. Other mothers feel guilty that they don’t feel as attached to the baby as they imagined they would, that life seems only an endless round of unfinishable tasks: there’ll always be another diaper, another cry for milk. Honestly, I don’t think anyone can really know ahead of time what it will be like to care for her own child (especially her first), so I’m not sure that there is a terrific way to prepare for that emotional charge, no recipe to follow to get ready. But I do think that it may help to expect the unexpected: you may not recognize yourself or your life after the baby arrives. Some of the possible changes? Relationships with your partner, friends and family. Work identity. Social identity. Spiritual perspectives. That is, Big Stuff. That is, you’re not looking forward to an adjustment but to a transformation, and the nature of transformation is that it’s not under your control. And your life is probably not going to be transformed into one that matches the mother-baby ads in glossy magazines. But sometimes the baby is fussy; nothing seems to help. Sometimes a baby may be a very quiet child who is easily tended, but not very responsive. In either case, the balance of “This is tough, but it’s worth it,” may be hard to come by. Sometimes a mother is so rooted in being good and right and accomplished that she judges herself harshly for not being able to solve her baby’s colic or keep her house pre-baby clean or maintain a pre-baby marriage or recover physically as quickly as she thinks she ought. Some of us are “wired” toward anxiety or worry, and that can lead to self-doubt and depression. The critical voice, however it enters, can be insidious: while some of us may demand of ourselves, “I should be able to impose order on this chaos,” others might think, “but I should be able to deal with chaos, be at ease with it.” Either way, we’re not being caring and careful and matter-of-factly realistic with ourselves. Instead, we’re performing for some audience, internal or external. Postpartum is an opportunity to be doing that edgy dance of keeping the familiar beat while a partner is leading you through new and demanding steps and twirls. How? I don’t think we can underestimate the value of rest and concrete, physical help with meals, laundry, errands, older children — a base that allows you to deal with emotional challenges. Also: Talking with friends, to sort out who you are becoming. Finding families you like, so that you don’t feel so alone. Staying grounded in your spiritual life. Actively looking for even small ways to stay connected to your partner. Your doula can offer even more suggestions. The irony is that many women have trouble taking these suggestions. Asking for help with meals means, oh-oh, ASKING FOR HELP, which can mean, in turn, “I’m not capable . . . and I should be.” Talking with friends about feeling disconnected from your baby – or very attached but also very tired of household chores — can activate “What’s wrong with me?” if those experiences are not shared. If you find yourself dismissing prenatal advice about how to get and use practical help postpartum, if you find yourself later wishing for help or advice but ashamed or guilty to ask for it, if you feel isolated physically or emotionally — it could be useful to explore what standards of mothering (or what picture of Mother) might be getting in your way. Perhaps you can do that on your own, either musing or in a journal; perhaps you might find a trusted friend or a spiritual mentor or therapist to guide you. Sometimes breathing, meditation, prayer or yoga can help to quiet the mind’s “static” enough to be able to focus on and deal with this pull to perform. I believe that attempting either to stay steadfastly the person you used to be or to become your own personal version of a Perfect New Mother — tying yourself to any particular standard or concept without leaving room for your actual experience – can be a significant contributor to postpartum distress. You need room, room to be a different mother than your mother or your best friend or your colleague or the celebrity in the interview. Now in postpartum, and as your child grows, it’s worth noticing both your lovely ideals and your outrageous, unreasonable standards. We need to find a balance between “I’d like” and “I must,” ways to accept our mother-selves in all their quirky human variety. This entry was posted in Musings and Articles on March 29, 2013 by suzswan.